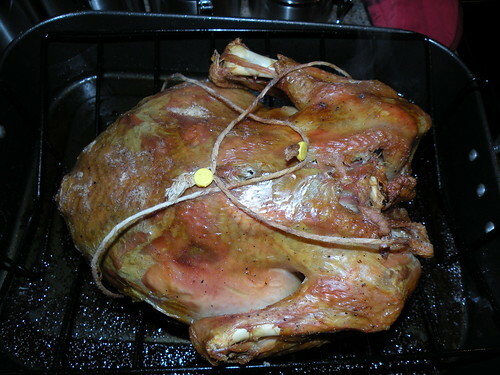 so now that we’re in 2011, i decided to wrap up the rest of thanksgiving 2010. 🙂 i’m excited to move on to the new recipes that i’ve been working on this year! the credit for this recipe goes to ma, my gramma lince’s mom. a special thanks goes to my mom for typing all of the instructions out for me! beautifully carved, thanks to tom! 🙂 it’s also served lince style, on a cheap “dump” platter. cut open 2 grocery bags. lay flat on top of each other with the wording on the outsides. on the long side, old over and inch or so 2 times, staple along this fold. open paper flat, put crisco in a big oval in the center on the flattest side of the paper (without the wording). 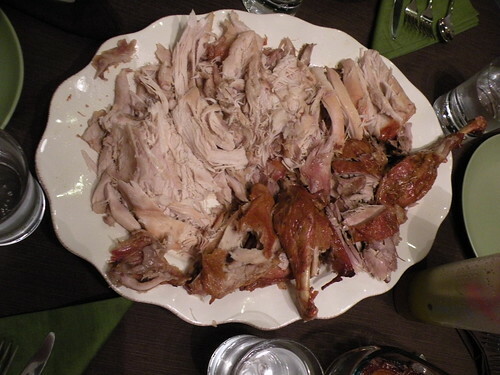 put brown paper over turkey with the crisco side against the turkey. this next part is best done with 2 people. wrap string around the paper just under the lip of the roaster, 2 times around, really tight. tie it in a knot. cut any extra paper to 2″ or so below the string, so no paper touches the oven rack. here are estimated cooking times (with stuffing): 10-18 lbs (3 3/4 – 4 1/2 hours), 18-22 lbs (4 1/2 – 5 hours), 22-24 lbs (5 -5 1/2 hours). do not peek until the time is up! you may smell the grocery bags getting hot, but it is ok, they will not catch fire. take out any stuffing and mix with regular stove top stuffing.add cold water to roaster to double the amount of drippings. stir with fork scraping pan to loosen bits of turkey. mix 1/2 c flour and 1 c cold water until there are no lumps. slowly add to drippings (you can transfer this to another pan, but it’s easier to use the roaster.) add salt and pepper and constantly stir on med – med high heat until bubbly and thickened. if too thick, add water, if too thin, mix 1/4 c flour to 1/2 c water til there are no lumps and add to gravy very slowly, stirring briskly so lumps don’t form in the gravy.